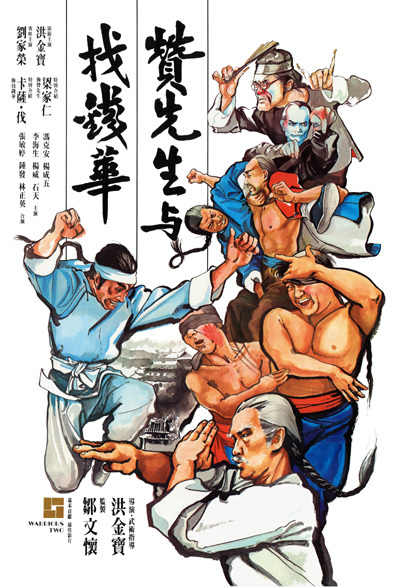 Plot: Cashier Hua (Casanova Wong) accidentally stumbles upon a murder plot and becomes the target of deadly assassins, but is rescued by Fei Chun/Porky (Sammo Hung), whose master (Tsan; played by Bryan Leung) is renown for his Wing Chun abilities. Cashier Hua’s Mother is murdered in an attempt to lure him out, so naturally our hero demands vengeance and beseeches the reluctant Master Tsan to train him. Shenanigans ensue! Also known as “Zan xian sheng yu zhao qian Hua“. “Warriors Two” is often considered a counterpart- or perhaps even precursor- to the more famous “Prodigal Son“, primarily for its emphasis on the Wing Chun style of Kung Fu, but also because of structural similarities. I was going to end that sentence with “and bi-polar tones“, but then I realized every movie directed by Sammo Hung would qualify as a counterpart to “Prodigal Son” and that wouldn’t be true. Once again, slapstick comedy immediately follows grisly tragedy and will probably be followed by more grisly tragedy, which will be interrupted with more slapstick comedy. In traditional Sammo Hung fashion, there’s no consistency, but at least there isn’t anything offensive, sleazy or mean spirited. I was surprised how much the humor tickled me though, as I had a positive reaction to nearly every comedic moment, despite me not being a huge fan of Hong Kong comedy. My favorite scene had to be when Fei Chun (Sammo Hung) is mock-teaching Hua ( Casanova Wong), but the script is armed with plenty of hilarious situations, sight gags and lines. Much like “Prodigal Son“, way too much time is spent on the hero attempting to convince the legendary teacher to take him on as a student, although this Master is unfortunately not a drag queen. Much like “Prodigal Son“, Sammo Hung is a supporting character, even though DVD covers and rental websites usually list him as the ‘star’. Much like “Prodigal Son“, the choreography is among the finest ever caught on film and will ultimately redeem any shortcoming that the movie might have. Strangely, “Prodigal Son” and “Warriors Two” suffer from completely different weaknesses, but I have already praised the fight scenes, so they are redeemed. 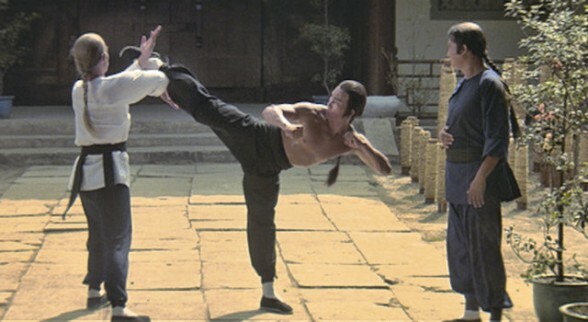 During an overlong yet intriguing training montage, Hua is instructed not to do anything ambitious in a fight, as it contradicts the simplicity of Wing Chun. From what I am told, “Warriors Two” does portray the martial art accurately, but every technique seemed highly ambitious, so it’s an odd contradiction. The choreography is filled with stylish and complex maneuvers, where extensive rehearsal was obviously required to properly execute them, although I have to give credit to the cast for making these techniques look easy. This isn’t a complaint either, as I had to pay extra close attention to the action, because I didn’t want to miss any of the cool moments and there were seemingly hundreds of those on display. I liked the entanglements, such as when a character would grapple with their feet while simultaneously striking with their fists, leading to unusual attacks, counter-attacks and defensive maneuvers not seen very often. Every move seems highly advanced and “Warriors Two” boasts A LOT of martial arts action- most surrounding hand-to-hand combat, although weapons are used as well. The choreography is so amazing that it actually becomes a problem, for it’s TOO good, TOO often. Because of the abundance of action, I often felt like there wasn’t enough time to properly catch my breath and being so attentive to the fighting only enhanced my exhaustion. The finale in particular is awesome, showcasing crazy stunt work, precise movements, grisly violence, and daring acrobatics, but it dragged on for way too long. I even began to drift off! Nevertheless, I adored the strategy driving the majority of the fights. Each physical showdown seems to tell its own story and the characters (both heroes and villains) will devise tactics in order to overcome their enemies. Invincible Masters can fall due to his enemies being better prepared, or sometimes the location and circumstances will be the deciding factor, even moreso than skill. The most creative scene in the movie is when a spear wielder pursues Sammo Hung in a dense, dark forest, where he can’t properly use his weapon, which is also giving his location away. I find that to be incredibly clever. I also love how the characters will make these elaborate plans, only for something to go wrong, forcing them to start from scrap despite being in the middle of a battle. “Warriors Two” has a better plot than “Prodigal Son“, although it’s just a generic revenge story…so that isn’t as much of a compliment as much as it’s…a lesser of two evils? Characters are prone to doing stupid things in order to keep things moving, such as when they’ll withhold information that could save peoples lives for absolutely no reason. At least within the first 20 minutes, we know the characters motivations and the narrative builds an overarching conflict. This is nothing special or new, but I remember not knowing what “Prodigal Son” was even about until its second half. However, “Prodigal Son” also had a much more intriguing cast of characters, who had stronger arcs and more colorful personalities. The only person who did NOT bore me here was Sammo Hung, simply because he’s so damn lively and funny. Everyone else is playing a flat ‘type’ with absolutely no substance or flare. The villains are all generically evil and the heroes are generically good. Master Tsan is so stoic that when he’s not showing off his martial abilities, he might as well just be a mannequin. Casanova Wong is an excellent kicker, but he’s lacking in charisma and never has the opportunity to differentiate his character from every other vengeance driven hero to appear in this genre. While Sammo Hung is now regarded as a legend, most of his starring vehicles during his prime were flops, even though they’re among the best kung fu flicks ever. Considering his infamous ego, I partially suspect that Sammo Hung intentionally cast bland- but marketable- faces in boring leading roles so that he could upstage them with his more compelling personality. So even if he wasn’t the main character, he would be the one everybody would remember. Just look at the scene when Casanova Wong learns that his Mother was killed. Even though he’s openly grieving, more attention is placed on Sammo Hung deciding how to handle the situation. As entertaining as he is though, his character is just fluff. He doesn’t develop or have any real stakes in the plot, while the duller protagonist is the one with the character arc. As always, these points are almost irrelevant when the focus will always be on the kung fu, but they do keep the movie from achieving perfection. Although as a bonus, the cinematography provides some eye popping imagery, which is rare for this genre. “Warriors Two” is a really good kung fu flick with some of the best choreography ever, but the plot is flimsy, the characters are dull and the pacing is perhaps too fast. But “Warriors Two” is proof that Hung is one of the most skilled action directors and choreographers in the industry, as even 40 years later, it still stands out as incredible. Overall: “Warriors Two” is a great- if flawed- kung fu flick, but it’s only great as a kung fu flick. If you’re aren’t into the genre, you probably will spend more time hating on the script.